GAZA - Palestinians terrorists have already installed the necessary infrastructure to transfer the Qassam rockets to the West Bank from Gaza, according to Abu Abir, spokesman for the Gaza-based Popular Resistance Committees terror group. In an interview with Ynet, Abu Abir said that Gaza’s new border would turn into an additional “blue line,” modeled on the border separating Israel and Lebanon. “It will be like the Hizbullah: Every Israeli transgression of this line or movement of forces towards it will give us the right to respond against the act of aggression,” threatened Abu Abir. The Palestinian Authority is doing everything to ensure a quiet withdrawal. Will you help their efforts? It’s natural that Israel would strengthen the Gaza border and mark it with a fence after its withdrawal. You’re already talking about full force, while the PA is demanding restraint from the Palestinian factions. It seems from your statements that the message to the PA is that you will want a piece of the cake on the day after the withdrawal. But the rockets and Israeli responses to them have only caused enormous damage to the Palestinian population and just last week, a group of residents from northern Gaza asked the Palestinian Authority in a letter to stop the rockets. “I’ll tell you what stands behind that letter. It is, first of all, a tactic by the Palestinian Interior Ministry, that is trying to say that the rockets are a failure and they don’t help anything, that they only cause damage. This is the official line of the Authority and Abu Mazen also says so, and many interests sand behind it. Second of all, the letter is trying to say that if the Qassam rockets caused damage, then they did not cause Israel’s withdrawal and the faction’s demands should not be accepted. Therefore we see this letter as part of a political struggle and it does not influence our own struggle. What is the definition of ‘all of Palestine’ for which the struggle will be continued? “That means all the area occupied according to law, and we will continue to fight over it. And it means that we won’t give the IDF and the settlers who are escaping from Gaza to the West Bank to abuse our people there. Palestinian blood is one and therefore we are ready to continue the struggle. For this reasons we have already set up the units who work to smuggle the necessary knowledge for fighting techniques, especially to do with the rockets, from Gaza to the West Bank. Hold on, rockets in the West Bank is a very dangerous thing. Would an (IDF) operation in Qalqilia cause rockets to fall on the Sharon area (central Israel) or on Tel Aviv? 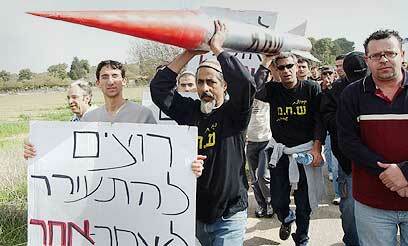 See all talkbacks "‘Rockets to threaten Tel Aviv’"